Command over one of the Ancient pantheons, step into the shoes of Ra, Zeus, Ah Puch, Odin, Bellonna or Nu Wa and guide your faithful into battle. This free to play game has elements of both card collecting MMOs and strategic board game based tactics. Hand of the Gods: Smite Tactics takes the characters reimagined from the third person MOBA smite and creates an intriguing turn based strategy that focuses on 1v1 battles. Hand of the Gods is a mix of both chess like board strategy where players move units around the battlefield and a traditional card collecting game where players build decks. Using five main Pantheon factions and a sixth Neutral faction players build up a deck of 25 cards and use them to battle in 1vs1 matches whether PVP or PVE. Each round players build up mana which they use to activate cards, whether Item cards played directly from their hand to influence the battle, or Units that are placed onto the board. The board is an 8x5 grid with a Summoning Stone at either end where players can place their own units around. 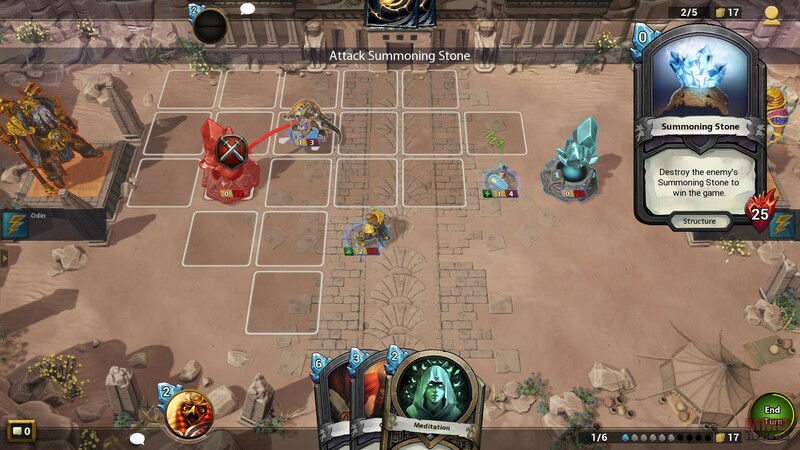 Each turn the players get to summon new units, play Item cards, or move their placed units around the board to make attacks. Attacks can be made upon the enemy units or, as is the objective, the enemy Summoning Stone which itself has 25 hitpoints. Destroy the enemy Summoning Stone and the game is won. The six key groups represent the ancient pantheons of Rome, Greece, Scandinavia (Norse), Egypt, Mayan Empire and China, led by the primary deity or key figure. The different pantheons each have their own unique items, units and Gods that can be used to build up a deck of 25 cards, and each will lean towards a different type of strategy. Minion Cards – The lower cost, but no less effective, units that when played are placed onto to the battlefield to fight enemy minions and destroy the opponent’s Summoning Stone. Each Minion has an attack value that determines how much damage they can deal, and a health value to determine how much damage they can take before they are destroyed. In combat with an adjacent target both units will make their attack on their opponent regardless of whose turn it is, however, ranged units (or some units that are immune to counter attacks) can avoid this. Many Minions have additional features that grant boons to themselves and their allies, such as adding protection from damage, additional movement or drawing extra cards. As well this they can have various hindering effects to enemies such as a powerful Silence that can nullify a target minions own feat. God Cards – A more powerful version of a Minion cards, only one version of a particular God can be on the battlefield at once, playing the same God card again simply heals that particular God up to full health. There are multiple ways to earn new cards, typically through purchasing Card Packs either with currency earned through playing games or through real money microtransaction purchases. Card Packs grant five completely random cards that can be for any of the Pantheons or Neutral group, as well as random rarities. Acquiring cards that a player doesn’t want to use, or has too many duplicates of (players can only have 2 of the same card in their deck) players are able to disenchant a card. When disenchanted the player gains resources that they can then use to create new cards that they want.